Ian Clifford has resigned from his position as Chief Executive Officer (CEO) of ZENN Motor Company Inc (ZMC) and has assumed the role of Founder and Vice-Chair of the Board of Directors of ZMC. Clifford, who founded ZMC in 2001, will continue to play a key role in defining ZENN’s future vision and strategic plans, the company said. …the main material in the ultracapacitor technology achieved relative permittivity of at least 22,500 over an operating range of -20 to +65 degrees Celsius. Permittivity is a measurement of how much energy can be stored in a material. The Army took delivery of six GEM LSVs, the first step towards eventually acquiring 4,000 LSVs. A total of 800 vehicles will be delivered in 2009, followed by 1,600 in 2010 and 1,600 in 2011. Not all of the vehicles will necessarily be GEMs which were procured through the GSA. The GSA currently lists GEM, Columbia ParCar, E-SUV and ZENN as LSV vendors. In an interview with bloggers, Paul Bollinger, Deputy Assistant Secretary of the Army for Energy and Partnerships, remarked that he expected to see more manufacturers to join the GSA list. The GSA posted a request for vendors on Fedbizopps.com today. He also noted in the interview that the Army had identified 28,000 sedans and light trucks that could potentially be replaced by electric vehicles, either LSVs or higher speed vehicles. Part of the reason they have moved to LSVs is that fueling station infrastructure for alternative fuel vehicles has not been able to keep pace with vehicle acquisition. The necessary infrastructure costs would be in the millions of dollars while the installation of three-prong outlets for charging the LSVs will only cost an estimated $200 per vehicle. 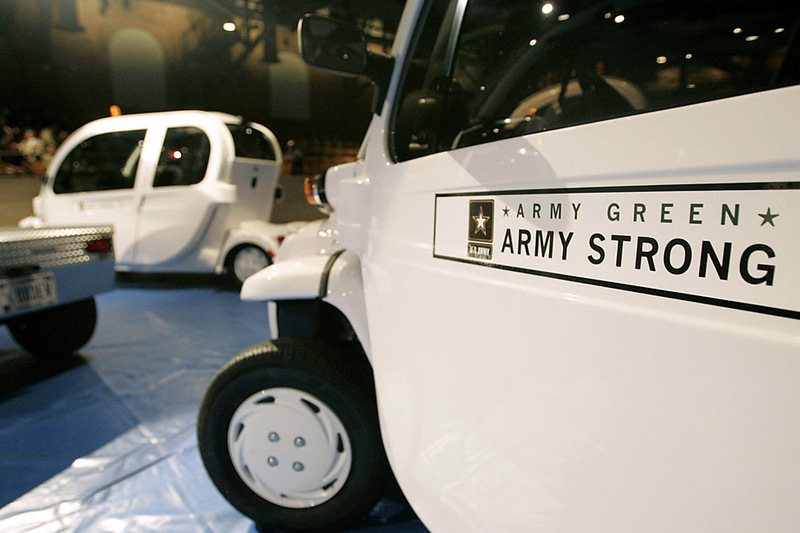 The Army estimates an LSV saves them $3,300 compared to a full-size sedan. The LSVs will be leased for six years and maintenance and battery replacement are included in the lease. Bollinger remarked that not only will the Army save on fuel costs but also produce lower emissions and help drive the market for LSVs and battery technology. The Navy has directly expressed interest in “piggybacking” on the Army program and while the Air Force has used back channels to show their interest in joining forces.